The New Nuclear Danger - Helen Caldicott, M.D. On September 18, 2001, one week after the World Trade Center disaster, Lockheed Martin, the country’s leading manufacturer of conventional weaponry, nuclear delivery systems, and national missile defense, took a full-page ad in the New York Times echoing JFK’s famous call to “pay any price to assure the survival and the success of liberty.” The ad offered an unusually public display of what is typically the invisible hand and muscle of the arms industry guiding American sentiment and government. In her uncannily timely new book, Dr. Helen Caldicott looks at the indebtedness of the Bush Administration to the arms industry and warns of the incredible dangers inherent in allowing weapons manufacturers to dictate foreign policy. Recounting the history of government collusion with industry, Caldicott shows how the merging of weapons firm in the 1980s created hugely powerful “death merchants,” including Lockheed and others, ready to lobby politicians and manipulate public opinion on behalf of their corporate interests. Now, with unprecedented acts of terrorism fueling the American public’s willingness to grant its government broad power to wage war, the constant pressure from weapons makers to use military force — and by extension, buy more of their weapons — poses the very real threat of nuclear war. Enumerating, as a physician, the medical consequences of such a war, Caldicott demonstrates conclusively that the notion of nuclear survival is a complete fantasy, and that nuclear victory is an oxymoron. 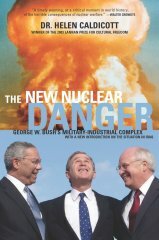 In the same way that a generation embraced Caldicott’s hugely influential Nuclear Madness and Missile Envy, The New Nuclear Danger stands to educate, alert, and mobilize millions of young people and concerned citizens, who must understand the planetary threat posed by overly aggressive nuclear scientific establishments and weapons industries in a volatile world. The edition published by Scribe Publications contains a specially written chapter for Australian and New Zealand readers.